"It's early November, and I am sitting in the office. I look to the left and right, feeling an awkward and uncomfortable tension among my coworkers. It’s been palpable for almost two weeks, and has made the confines of our dry-walled prison unbearable. I looks across at fellow guide Dave and his leg is shaking with edgy anticipation, only comparable to the unbridled excitement of a Labrador pup. Everyone is suffering from early season snow anxiety. Dreams of perfect powder, glorious glades and stimulating steeps have stifled any hope of accomplishing the least bit of work around the office." - James Brown (JB), SWS Mountain Guides Senior Guide. Though I don't have nearly the vertical feet under my belt that JB does, it's hard not to get excited about ski season (and ice season!) coming. Luckily, thanks to the likes of Matchstick Productions, Red Bull Media, and Warren Miller Entertainment, JB and I have been able to get the pre-ski season fix "that only the best ski flicks and provide." These are three new releases you won't want to miss. Match Stick Productions’ (MSP) Attack of La Nina follows some of the top skiers in the world through the 2010-2011 ski season. Many consider it to be one of the best ever recorded snow seasons in history from Colorado to California, Washington to British Columbia and even Alyeska in Alaska. The pros of MSP are always finding creative ways to push the physical limits of what can be done on skis. The cast of this epic reel is composed of some of the most talented skiers in the world, including Mark Abma, Eric Hjorleifson, Ingrid Backstrom and new 15 year old ski phenom Torrin Yater-Wallace. I would give Attack of La Niña 4 stars. It’s a film worth seeing but not one that is in danger of changing your perspective on life. Watch the trailer here. This release came in with a level of excitement that has surpassed any premier I have been to since Steep, (in my mind still the best ski movie ever made). Much of this excitement was contributed to the fact that the featured athlete Travis Rice had not been on the big screen in two years. Also contributing to build up was the fact that it’s Red Bull Media House’s first major movie. That’s right, the same Red Bull that “gives you wings” and has been shamelessly endorsing athletes for years now is making movies. The Art of Flight maintained a better storyline following Travis Rice, Mark Landvik, Eric Willett and friends through their world of extreme snowboarding and first descents. Travis and crew travel the world looking for the best lines imaginable and have more than just a little bit of fun along the way. Much like MSP’s Attack of La Niña, the athletic feats in The Art of Flight are accompanied by spectacular cinema photography and a great sound track. Much like a Quintin Tarantino flick, the filmmakers have mastered the art of placing the right music at the right time to create the perfect mood. As one premier goer said as we were walking to the after party, “watching that makes me realize how badass I want to be”. Though there is little comparison between the average Joe and a professional snowboarder, The Art of Flight taps into the idea of what else is out there and inspires even a skier like myself to push the limits. Watch the trailer here. showing of Like There's No Tomorrow! 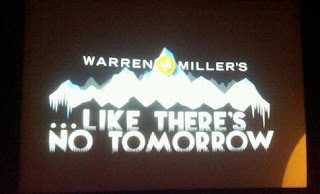 For the 62nd year, Warren Miller Entertainment managed to produce an eye-popping, adrenaline-fueled, jealousy-invoking masterpiece. You'll laugh, you'll cry, and you'll want to quit your job to become a ski bum. Did I mention it's narrated by Jonny Moseley? The film begins with a segment on skiing in India and the Kashmir, continuing the Warren Miller theme of shooting amazing talent in exotic locales. New Zealand's Southern Alps are the next exotic destination, and Portillo, Chile makes an appearance as well. We follow US Ski Team legends like Julia Mancuso through the Andean mountains, then decorated downhiller Daron Rahlves on his bone-jarring "Banzai Tour." My favorite segment was a piece following Chris Davenport back to his New England routes and down the Tuckerman Ravine on Mount Washington. Like There's No Tomorrow also features a segment paying tribute to the late Kip Garre. A perfect mix of humor, passion, history and exploration, Like There's No Tomorrow is a must-see in my book. The fact that WME chose to feature John Brown's Body, a band I grew up listening to in Upstate New York, had two songs on the soundtrack! Nice going, guys. Watch the trailer here. See any of these, or other great flicks in 2011 or otherwise? Leave a comment! I've heard only great things about "Art of Flight." That's definitely on the list to see. The only premier I caught this year was TGR's "One for the Road." Pretty good, but I can't say I was especially impressed. Just a standard ski flick. I would put TGR's film One For The Road above this year's Miller picture. Epic footage and awesome soundtrack are more stimulating than yet another standard WM Entertainment flick. I know that's semi sacrilegious but everyone likes his movies like opening stockings at Xmas... Um... Can we get to the real presents now. Anywho, all three films on this list are great, but don't discount the boys from Teton Gravity Research. Cheers!